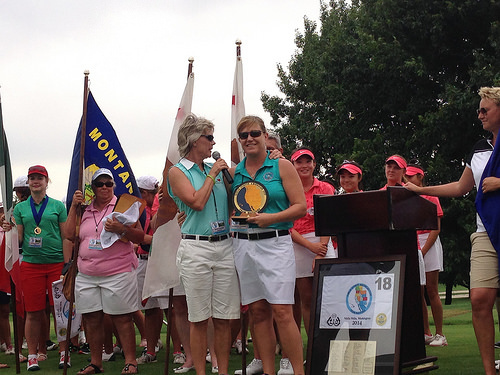 2014 Team Captain and host Patty Curtiss of Washington awards 2015 Team Captain and host Rachelle Pearson of Wyoming the traveling trophy. If you want to tell the world about GJAC, contact us! We will be happy to provide you with all the information needed. Rolling out the history at GJAC 2014 in Walla Walla, Washington – “Where it all began” 37 years ago! A tribute to the founder of GJAC, Joan Teats, who put into place many unique traditions still being used today. The Sun Country Amateur Golf Association and University of New Mexico Championship Golf Course showed the true spirit of New Mexico at the 2013 GJAC in Albuquerque.